Our standing-room only celebration - and call to action - was a huge success. If you weren't able to attend, here are some thoughts on the event. It was just a year ago in late December when I accepted the position as Conservation and Responsible Recreation Manager for The Mountaineers. If someone told me then, that within my first year on the job I would be taking a lead on planning an event to mark the 50th anniversary of the Wilderness Act, I think I would have cited my lack of event-planning experience. - but thanks to event co-hosts REI and the Wilderness Society, and a creative, passionate steering committee, we made it happen on November 15th. Explore Washington’s Wilderness was a special event to celebrate the landmark conservation bill that created a way for Americans to protect wildlands for future generations. The event space at REI’s flagship store was filled to capacity with people who came together to celebrate the anniversary and to learn about our region’s wilderness areas and what can be done to protect these important places. There were people - most notably Polly Dyer - who attended because Wilderness and conservation have been integral parts of their lives for decades. And there were equally as many young people who came to be introduced to Wilderness. 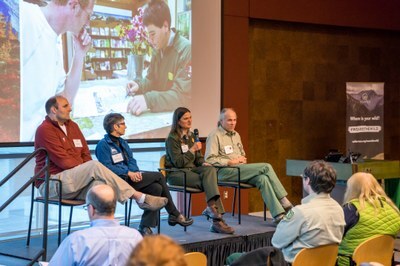 I sat in awe of speakers who inspired us with stories of legendary achievement, passionate connection, and serendipitous opportunity – each inextricably linked to Washington’s wilderness areas and each making a call to action that must be taken to ensure Wilderness thrives for another 50 years. Jim Whittaker, the first American to stand on top of the world, learned to climb with The Mountaineers at the age of 16. He spoke about his introduction to the outdoors as a boy growing up in West Seattle and the following decades he spent climbing first on Mt. Rainier and then on Mt. Everest, where in 1991 he led an International Peace Climb with American, Chinese and Soviet climbers. Before leaving the mountain, Whittaker’s three-nation group burned, buried, or packed out nearly two tons of trash accumulated from previous expeditions. It was clear that his work and his life were unequivocally impacted by these places that over time he observed being “loved to death" by growing numbers of hikers and climbers. Jim is an example of how The Mountaineers has affected tens of thousands of lives over the past half-century. Many of yesterday and today’s conservation advocates had their start like Jim, with meaningful outdoor experiences that inspired a connection and love of the natural world. While the Wilderness Act has accomplished so much over the past 50 years, there is more work that must be done today as we look forward to next 50 years. With an increasingly urban demographic (globally, 50% of the world’s population lives in urban areas), and increasingly lower engagement in environmental issues, we must consider how we will create the broad-based involvement and support we need to usher the conservation movement into the future. We must ask how we will get younger and more diverse groups to care and learn that conservation is in their own self-interest. These are just a few of the conversations that we hoped to inspire by hosting this event. Recent research and demographic data suggests that today’s generation is more racially diverse and urban based than ever before. These young people have priorities different from their parents’ and grandparents’ generations in terms of spending, ownership and how they engage on issues. 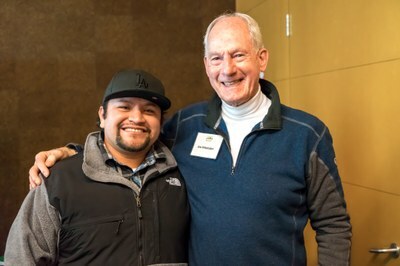 Juan Martinez, a National Geographic Emerging Explorer and North Face Ambassador for Outdoor Engagement, focuses his work on inspiring and nurturing grassroots action by the 15- to 29-year-old “Millennial” generation. A proud native of south central Los Angeles and former gang member, Juan shared a story of his introduction to the natural world through his high school Eco Club – as an alternative to detention. Martha Kongsgaard calls herself an essayist. And I was struck by how she poetically inspired a motivation to act. A Pacific Northwest environmentalist who currently chairs the Puget Sound Partnership, Martha jokingly thanked us for positioning her in the program behind “one of the great American heroes, perhaps the penultimate American icon of conservation, exploration, and inspiration” and “in front of the incorporable Juan Martinez.” No pressure. Martha eloquently shared examples and reasons to advocate for Wilderness. So what does conservation advocacy look like for us at The Mountaineers? We work at the confluence of conservation and recreation, and hosting this event is part of how we answer this question: we are Washington’s leading voice for protecting the outdoor experience in the Pacific Northwest and beyond. We undertake conservation advocacy work through bringing together partners and coalitions, advocating for the protection of our wild places, and working with land managers and lawmakers. We do all of this to protect the wild places that inspire us. We undertake advocacy work on behalf of our members, while also engaging them on relevant conservation issues. One of my favorite stories from the afternoon is of two young women – newbie hikers – who heard about the event as REI customers and very much reflect Tom’s comments. For them, hiking started as a step out of the gym and onto dirt trails. Then from trails close to Seattle, like Rattlesnake and Mt. Si, they came to the event to learn how to Explore Washington’s Wilderness and to learn what’s out there and where to go. They told me they left inspired to visit some of the places they learned about, but also to get involved, from participating in trail work to learning more about Wilderness campaigns. And that’s exactly what we need from our next generation of conservationists in order to steward the next 50 years of Wilderness. This is was what November 15th was all about. I'd like to thank REI and the Wilderness Society for co-hosting the event with us. And acknowledge our event partners, Braided River, United States Forest Service - Mt. Baker-Snoqualmie, Washington Wild, and Washington Trails Association, who contributed so much to event planning and implementation, and to our event sponsors including Green Trails Maps, North Cascades Conservation Council, Pew Charitable Trusts, and Snoqualmie Brewery and Taproom.